La Cala Barceloneta - This little hidden gem was close to the harbor and was very quiet and relaxing even though it is in a busy city. I wish I lived close by to a cafe like this as I would definitely be a regular. La Cala offer a range of cakes, pastries, juices, milkshakes, coffee's and some amazing acai bowls! I tried the avacado sandwich which was delicious and sat outside on their terrace which was decorated with plants and pink interior. 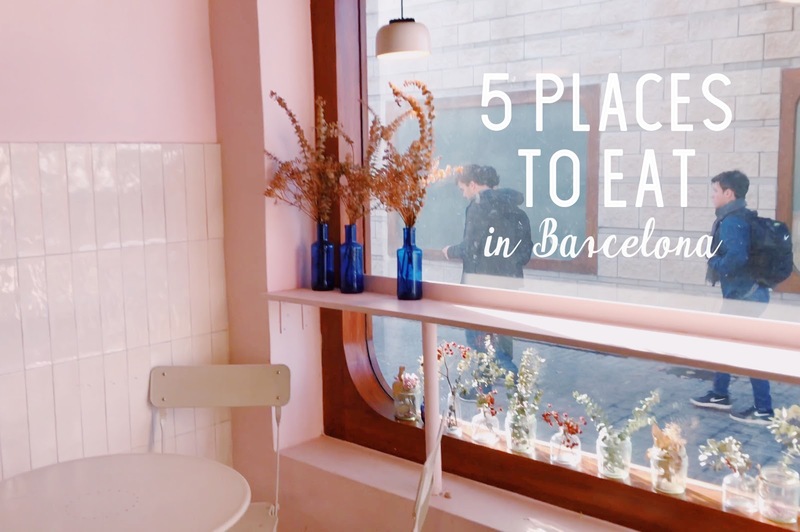 La Roseta Barceloneta - This coffee shop is ran by the same owner as La Cala. Again, the interior design is beautiful and extremely aesthetically pleasing. They have some of the best sandwiches and perfect for any sweet-tooth with their range of cakes and pastries. La Central Hamburguesería - If you're looking for something to eat in the evening. My boyfriend took me to La Central and it was one of the nicest burgers I've had in a while! I love the concept of creating and choosing your own style. You fill in a form of your own choices , pay and choose where you want to sit before your food get's served to you. It's a chilled out place, perfect for going with family or friends. Trópico - This place serves the best brunch and some amazing latin, south america style meals. Vegan and Gluten-free friendly too! I was mostly intrigued by their amazing, tropical themed cocktails - they look so cool! You can see some of the food places in my vlog on YouTube - click here to watch!